Air movement through a home is from ground to sky (and out through the attic and roof). By adding insulation and sealing air leaks in your attic, you can lower energy costs by preventing conditioned air from escaping your home. On the flip side, insulating and air sealing your attic can prevent unconditioned outside air from coming into your home. This means your HVAC system doesn’t have to work as hard to maintain your home’s optimal inside temperature. Heating and cooling costs can total 50% to 70% of the energy used in an average home. In fact, in late 2016 the Energy Information Administration predicted natural gas users would see a 22% climb in their heating bills over the 2015-2016 heating season. Every day that passes is one more day you are spending too much money on energy bills. 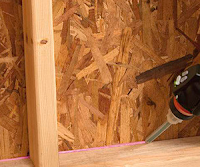 Adding insulation to your attic is one of the most cost effective ways to save money on your energy bills each month. 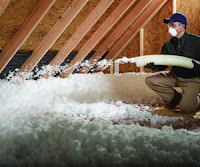 Wondering if your home could benefit from additional attic insulation? Contact us today for a free attic insulation estimate. If you would like to increase your home’s energy efficiency, we recommend investing in two key projects – insulation/air sealing your home and your home’s heating/cooling system. Since the home is one contained unit, each system directly affects the other system. By taking a whole house approach to energy efficiency, the homeowner can experience a greater improvement in efficiency and comfort. And upgrading two systems can qualify the homeowner for rebates and other incentives. Home energy improvements start with a home evaluation. A contractor will inspect the interior and exterior of the home to determine where energy improvements are needed. Leaks around a home allow conditioned air to escape and unconditioned outside air to enter. Leaks are often found in attics and around the perimeter of the basement. Sealing air leaks can reduce wear on your home’s heating and cooling system and help maintain your home’s internal temperature. If your attic doesn’t have adequate insulation, your contractor will likely recommend adding insulation. If your heating and cooling system is more than 10 years old your contractor may recommend replacing it with a new, more efficient model. According to ENERGY STAR, when installed correctly high-efficiency heating and cooling units can save the homeowner up to 10% on annual utility bills. In addition, installing and properly using a programmable thermostat can save the homeowner up to $180 per year on heating and cooling costs. Controlling the air that enters and exits the home and conditioning it with efficient equipment are two key steps to increase your home’s efficiency. By addressing both improvements you’ll see greater energy savings and enjoy a more comfortable home. Contact us for a free air sealing and insulation estimate today. Local rebates at your fingertips! Energy upgrades are a great way to save money on your energy bills and make your home or business more comfortable. While the investment saves money over the long term, the initial investment can cause people to hold off on performing these upgrades. There are a variety of local rebates available to offset the cost of energy upgrades. Rebates are available through local utilities including BGE, Pepco and Potomac Edison. There may be other rebates available to you – and we have a resource to help you find these. DSIRE is a resource available through the N.C. Clean Energy Technology Center at N.C. State University. 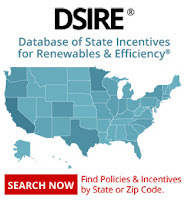 Funded by the Department of Energy, DSIRE provides a comprehensive list of rebates and incentives available by zip code. Simply enter your zip code to access a complete list of rebates and incentives available to you. In addition these programs, you can finance your energy upgrades and make the investment even more reasonable. Have questions? Ready to get started on your upgrades? Contact our office today! Author adminPosted on December 5, 2016 October 3, 2018 Categories DSIRE, insulate, rebates, save moneyLeave a comment on Local rebates at your fingertips!